Sphere of Control is the stuff you can decide on your own. This is people you manage and project you do the work personally. Sphere of Influence is stuff that you can guide through collaboration or subtle techniques. Your friendly co-worker is part of your sphere of influence. 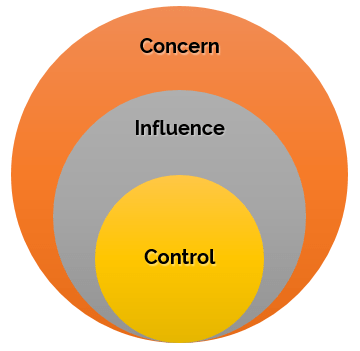 Sphere of Concern is stuff you care about but you have no way to influence it. This might be happenings in other departments in which you don’t have strong connections. Let’s take a look at some different circle widths and how they change things. These are the best people in an organization. They don’t control a whole lot, but they influence a ton of things. Product Managers usually have little managerial control, but work with many people in the company. In general, you want people like this. However, they can get very unhappy if their sphere of influence diminishes. I used to be a person like this at Marketo. I had the ear of many of my fellow co-workers. Unfortunately, under one of my less favorite bosses, my influence slowly melted away. (long frustrating story) That left me in the state of the next archetype. I became the complainer because I had this little tiny sphere of control, not much smaller than my sphere if influence. Most people hate to be in this position, and I certainly did. The problem with this diagram is that the sphere of concern is enormous, but the person can’t do anything about it. See how much better this is? They have the same influence and control as above, but they have a much smaller sphere of concern. They are happy because their world is smaller and their ability to influence their sphere of concern is “proportional”. That’s a key insight here. Proportionality is the key to success and happiness. Don’t let your sphere widths get out of whack. Of course, you can give someone more power, more control by promoting them and giving them many people to manage. If they have a circle like the following then I would propose they should care more about the other areas of the company. The best situation is when you balance out people’s aspirations of concern and their influence and control. You generally want people to be influential, but not at the cost of their own areas or their sanity. Is this blog post the most wisdom filled block of text I ever wrote? Probably not, but they can’t all be zingers. I need to keep it balanced!